Commodity price risk management applies to a broad spectrum of industries. It ranges from processors that convert raw commodities into products, such as wheat into flour, to users of those products such as food manufacturers and foodservices companies. Those who buy commodities or commodity products know prices can be very volatile. Moreover, Price volatility can destroy profitable margins and encumber budgeting objectives, cash flows, and even competitiveness. Prudent buyers know that price volatility can be mitigated by a variety of risk management tools—including supplier pricing contracts. In the end, the objective of all price risk management tools and strategies is to secure opportune prices when offered by the market and to extend that coverage for as long as possible. Over the years, our experience shows that recognizing and understanding the sources of price risk are among the first hurdles for many companies. There is often surprise, and a large degree of skepticism, to learn that futures markets are the foundation of commodity pricing, and they represent the greatest source of price volatility for the most used ingredients. Nonetheless, futures markets represent the foundation of commodity price risk management. The skepticism arises from the association with speculative traders. The sources of volatility are global, and many and have increased in complexity over recent years. They will be discussed in a future blog. But the reality of speculators’ role in the market is to take on the risk that commercial users—procurement professionals—wish to shed. Continuing with our wheat example, the following infographic illustrates how wheat futures provide the foundation for the price paid to producers and, by extension, for flour. This is true for all commodities that are publicly traded on an exchange. 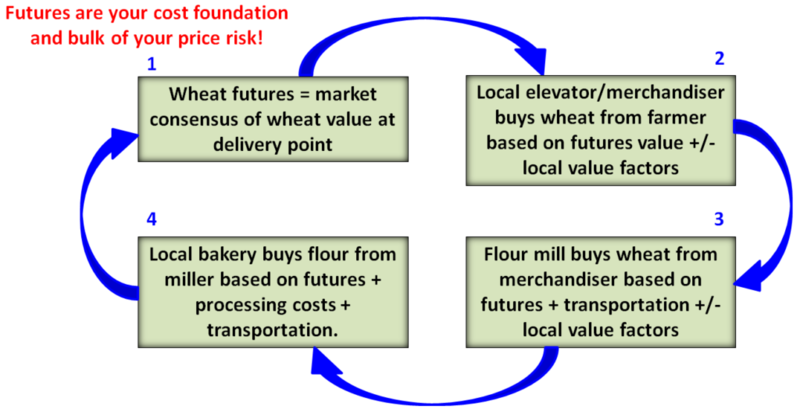 At each step from field to bakery the futures market provides a benchmark price to which discounts or premiums are attached to cover local supply and demand factors, transportation and processing fees. Enable more competitive pricing to your customers. We will cover specific tools and strategies in future blogs. There is a wealth of information and training opportunities available to those interested in learning more about price risk management—including training offered by Trilateral. In future blogs we explain specific strategies and tactics in more detail.